Nooooo. The air pollution has already hot stratospheric levels and is choking the life out of our poor lungs. Aah ....now we are talking sense. Like really !! And chilli flavored treats are just the thing that I have in mind. For the uninformed, Capsaicin in chillis not only speeds up the metabolism but also ensures that a smaller portion makes us feel full. Even from my experience, the latter holds good especially when it comes to desserts. Doesn't that sound like a blessing in disguise ?But the real reason I love a hint of chilli in my dessert is that it kind of intensifies the flavor. 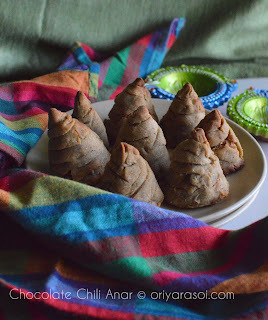 The Chocolate Chilli Anar is a wonderful twist to our very own "Gujjiya" or "Karanji", which is must have Diwali delight. The all purpose flour is swapped with a gluten free flour and the coconut stuffing is infused with a heady mix of dark chocolate and bhut jolokia chili. Moreover, it is baked instead of being dunked in hot oil which ensures that we stick to the 'healthy snacks' resolution. The conical 'anar' shape is just perfect for the ongoing Diwali festivities. Thank you Plattershare for this wonderful opportunity !! Pour the ghee a saucepan. Add the bhut jolokia to the ghee and wait till the ghee is sufficiently hot. Do not let it smoke else the chili's heat will cause burning sensation in eyes, nose and throat. Add the coconut and keep stirring lightly till it turns light brown. Remove the chili and add the choco chips to the pan. Keep the flame to a minimum. Once the chocolate has melted, add brown sugar and salt. Mix everything together. Remove from flame and keep aside till bearable to touch. Pinch out small portions of the stuffing and shape into conical mounds. Take the flour, ghee and salt in a mixing bowl. Rub everything together till it is mixed evenly. Add water little by little and make a tight dough. Let it rest for 30 mins. Take small portions of the dough and roll it out . Cut out ribbons with the help of a knife. Make small round discs with the remaining dough. Place a mound of the stuffing on each disc. Take the ribbons and wrap it around the mound to give it the look of an anar. Repeat the process for making more such 'anar's. Baking - Preheat the oven to 180 degrees. Place the 'anar's on a baking tray and pop it into the oven. Let them bake for 12-14 mins or till done.